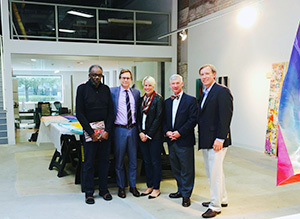 In September 2014, artist Sam Gilliam (left) welcomed MAG visitors to his Washington, DC studio. With him are Jonathan Binstock, director; Trudie Kirshner, vice president, Board of Managers; Joe Carney, director of Gallery advancement; and Jim Durfee, chairman, Board of Managers. Thanks to a collaboration with the Eastman School of Music, a visit to MAG’s medieval gallery is now a feast for the ears as well as the eyes. “Medieval Sights and Sounds” features period music from a new database on the free MAGart app; and a gallery guide and interactive kiosk in the recently reinstalled space. The project was funded by the UR Provost’s Multidisciplinary Award. In February 2014, “Medieval Sights and Sounds” was the subject of “Echoes of the Middle Ages,” a concert by Schola Cantorum of Christ Church Episcopal Church, Stephen Kennedy, director; with Michael Alan Anderson, assistant professor of musicology, Eastman School of Music. It was also the subject of the March 2014 “What’s Up” talk. Listen to an interview on WXXI’s With Heart and Voice as Schola Antiqua of Chicago is featured in a half-hour broadcast heard locally on February 2, 2014. The ensemble recorded music that celebrates various objects on display in the medieval gallery. Host Peter DuBois welcomes artistic director Michael Alan Anderson and MAG curator Nancy Norwood to the studio to discuss the project. 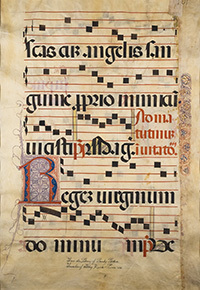 Top of page: This 15th-century French Leaf from an Antiphonary: Music for the Office of Matins is on view in the medieval gallery. Now, the work is off the wall again as part of a scheduled rotation that will extend its life and preserve its vibrant colors. 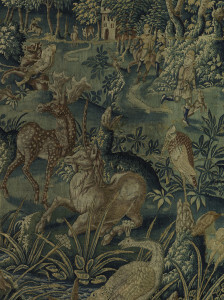 In its place in the 2nd floor Renaissance Gallery you can see another recently conserved 16th-century tapestry, Battle of the Animals (detail at left). 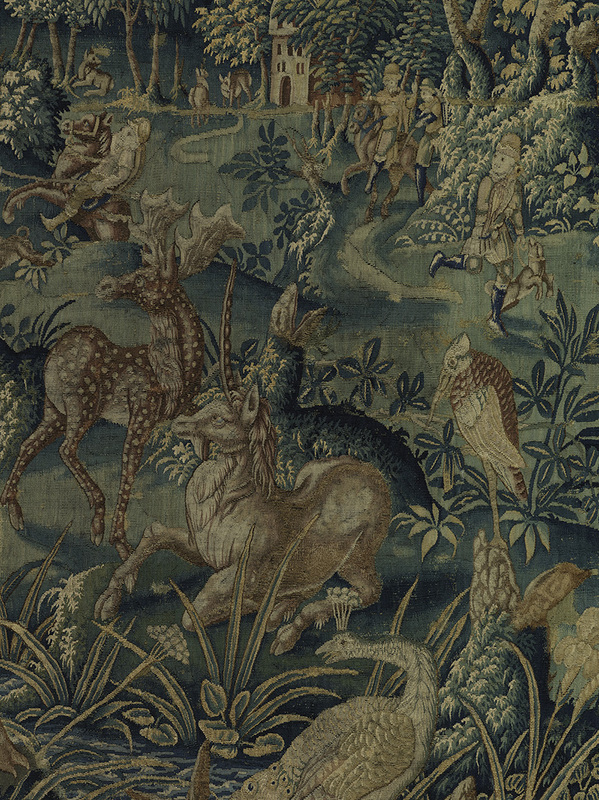 The first tapestry acquired by the Gallery, it was unveiled in 1926 for the inauguration of the McKim, Mead and White Fountain Court addition. In recent decades, however, it’s been off view because of condition issues. Learn more about the European Tapestry Initiative. Tapestry photo by John Bigelow Taylor. As visitors to the 2006 exhibition Extreme Materials may remember, Devorah Sperber’s stunning installations explore the ways we see and perceive our world in the digital age. Using special software, Sperber scanned a photo of Grant Wood’s iconic painting, American Gothic. 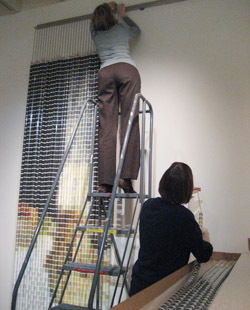 The resulting heavily-pixilated, inverted image was her blueprint to assemble 4,596 spools of thread. From close up, the viewer sees only fields of color, but upon stepping back and looking through an acrylic sphere (or is it a crystal ball? ), the scene magically rights itself. See for yourself, in the exhibition corridor near the Lockhart Gallery.